While traveling the world, I promised myself that we would fish in some memorable and exotic places. But when we arrived in Queensland, Australia, our year-long adventure was almost over and not a single fish had been landed. We stumbled off the bus in Rockhampton without enough cash to keep traveling slowly to Sydney, where our flight home awaited. The only solution was to lie low at the hostel on Great Keppel Island, spend absolutely no money, and then make a final dash on the midnight bus all the way down to the airport in Botany Bay. But what can you do on a tropical island with hardly any money? Trish settled for lying on the beach beneath a sunscreen-ridden paperback but I knew the time had arrived at last - I was going to fish! A shack beside the beach offered rods and bait for three dollars a day. After begging the money from the kitty, arguing that we could eat whatever I caught, I proudly set off down to the impossibly blue Pacific Ocean. I hooked up my bait and cast out into the waves. Straight away, I felt the tell-tale twitch on the line which meant that something was nibbling at my bait. I drew the rod upwards in a 'strike', to lodge the hook in the fishes mouth, then started to reel him in. But the line was slack and came in far too easily. My hook came back to me bare, its tasty piece of squid all gone. I baited up again, cast again and the same thing happened again - good bite, good strike, good bye. All morning I baited, cast, struck and lost with infuriating regularity. A passing Australian couple giggled, amused by this weedy translucent fool who patently couldn't fish for nuts. When all my bait was gone, I hauled myself back to the tackle shack, frustrated, dejected and with no dinner to offer my girlfriend. The owner was amused to see me back so soon. "The Fish," he said, " They're called ‘Flat Head’ and you're going about them all wrong. Let me give you a tip…"
As well as his advice he also gave me a free refill of squid. Back I went to do battle one last time. I had just cast the first of my new bait into the waves when the Australian couple came smirking back from their walk. "'Devil for punishment, mate?" the Aussie said. At that moment I got a bite, the thirty-second of the day. I turned, put the rod over my shoulder and ran full speed off up the beach to where Trish was reading her book. "What is it, what's wrong?" she cried. I stopped beside her and turned. The Australians, frozen at the shore, were gaping up at me as if I was mad. Perhaps I was but there, half-way up the beach, also gaping, thrashed a large silver bug-eyed fish. My Flat Head had landed. I spent the next hour belting up the beach pulling legions of bewildered fish out of the pacific. A small crowd gathered to applaud my technique and I was the toast of the 'barbie' that very evening. And if you think this is just a tall fishing tale, go on down to Great Keppel Island and try it out for yourself. What an anecdote. It's begging for the short story treatment. My favourite bit is when the crowd gathers - I got quite a rush of vicarious triumph. Is Australia worth going to? I don't think I would like it (before any proud Australians get cross, I'll mention that I have a low low tolerance for hot weather). hmmm......so, did you actually cook the big fish? I love that 'is Australia worth going to?' from Fiendish. Tourist Offices around the world weep at the onset of doubt! Lovely fish story. Not for lovely for the fish of course but very funny. And I thought my husband "fishing" with a bow and arrow was um...interesting. [He owns an archery shop]. Then again, the largest one he caught using that method was a 55 lb. 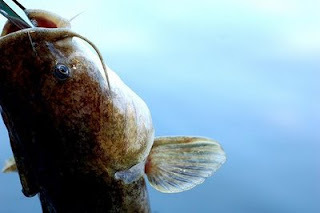 flathead catfish. They put up a good fight and you have to pull them in using the hand over hand method on the line. The first time I went fishing as a kid it was with a length of orange gut and a hook - no bait. With this unlikely setup I bagged a little fish. I have no idea what kind. Thereafter I persuaded my father to fork out for a rod and reel and all the accouterments that go along with these and I never caught another damn thing all my life, not in the ocean and not in a river. I am seriously jealous. I wish I could have been there with a camera! Hi Fiendish: Thanks :) I cringe a bit at word 'anecdote' don't you? it's like something you drink when a snake bites you. Rachel: As above, most of the fish went on to live long and fruitful lives. Fishing with a bow and arrow is very 'Deliverance', Hope. I for one am dead impressed. I picture your hubby as a pre-smokey-and-the-bandit-moustache-Burt-Reynolds, bow tensed... Damn I'm getting carried away now. Somebody say something macho, quick. Jim: I love fishing, I come from an accomplished fishing family (mostly trout and salmon) but I am the black sheep in this regard having never shown any real talent for the finer points of casting a fly. But put me by the sea and I will haul those fishies out for ya! Brady:I wish you could have been there too, we could have talked about writing and stuff and you could have taken a turn at the Flat Head. Ken, we drove up the coast from Sydney to Townsville in 1981 and although we didn't get our rods wet fishing, we did enjoy the fish. We often tell the story of how my Dad enjoyed a dinner of Barramundi so much at one little motel restaurant along the way, that after that night whenever we consulted a map to see which end of woop woop we were at, he'd say "didn't we just pass through Barramundi?". Yes, to this day, every town in Queensland from Mackay to Townsville was "just past Barramundi". Great country, great fish, great stories. Sometimes we temporarily re direct the water by building temporary stone walls, leaving the fish free for the picking. They struggle on the emptied water bed while we pick them up like shells. Thanks for sharing a story that evoked good memories . Jena, in Ireland we call that first method 'Tickling' and some people would boast that they used to tickle Trout out of the river for their dinner. I never saw it though. I don't doubt that you could tickle a little fishy for your dinner or, failing that, compliment it right out of the water. Great tale (fish-tale! ), and thank you for the dedication. Although I hope that I don't generally make you think of fish. Great story! I love to fish and living here in Minnesota is great for it. I went fishing in the ocean recently and didn't catch anything. Next time I go I might use your way. Good stuff!